A picnic can be a wonderful time to spend with a partner or your family. 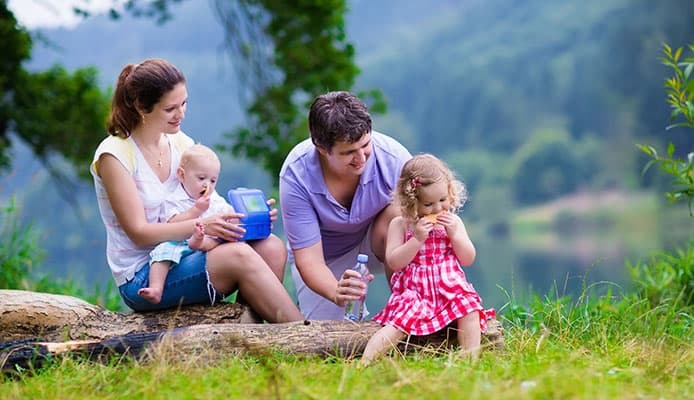 It can also be frustrating if you forget anything or don’t have a suitable carrier to take with you, which is why getting the best picnic backpack will help to take all those worries out of your mind. In terms of what can replace the best picnic baskets backpacks are highly convenient and very easy to carry. In order to find the perfect of for you, we have completed backpack reviews and a guide to answer all of your questions. Once you’ve read through this, you’ll know exactly what you need. This is a brilliant backpack picnic set from Sunflora. 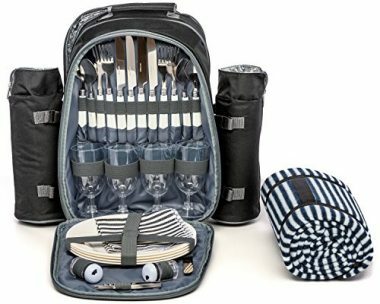 It’s not only stylish but it gives you everything that you need in order to have a brilliant picnic. It features a large insulated food compartment as well as perfect segments for your tableware. It comes with a waterproof pouch where you would be able to put chilled drinks or ice without getting any other contents wet. This is a stylish backpack and one which comes with everything you need to have a brilliant picnic. The fleece blanket has a waterproof backing so it will always stay comfortable with stainless steel cutlery and fine plates to ensure you have an enjoyable dining experience. 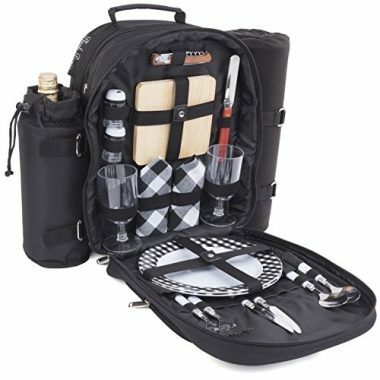 This is perfect for two people and it light and portable enough to be taken anywhere. 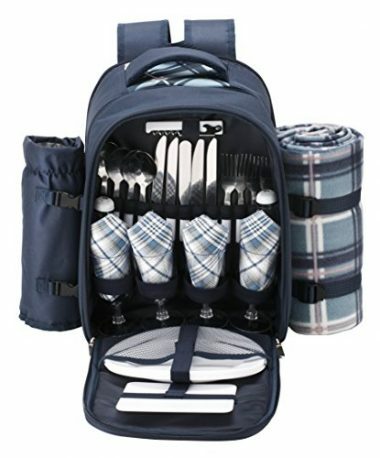 This is one of the best picnic backpacks for 2 and one which will give you a wonderful experience. 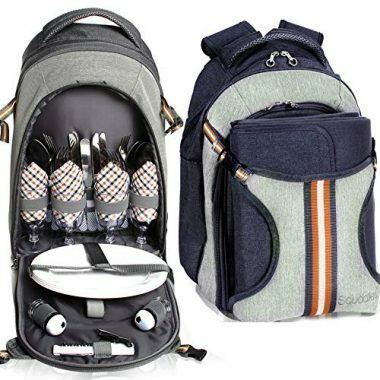 The cutlery section opens from the side which is unique when compared with most backpacks but allows the bag to be very compact and still have a large main compartment. The fleece and the bottle holder are placed at the back which makes it very easy to carry. This is a fine example of a picnic backpack for 4 from VonShef. It has a large cooler compartment in order to keep your food fresh and is easily able to support 4 people with its high-quality cutlery and plates. The softly padded shoulder straps help to make this a very easy bag to carry and you’ll hardly notice wearing it until you get to your destination. 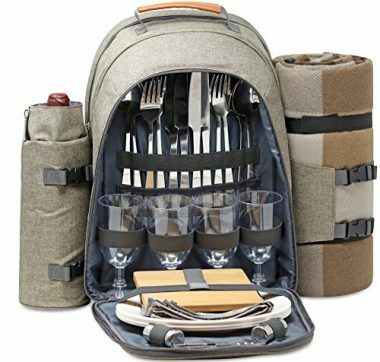 This is an insulated picnic backpack from Oniva which will allow you to dine in comfort and also works brilliantly as a wine picnic backpack. It has a very stylish design and it will look great when on your shoulders. It features two cooler compartments allowing you to separate your food and drinks with additional pockets for your valuable items. This is another backpack which has a stylish design and has waterproof fabric should you ever get caught out in the rain. The blanket is extra-large and will easily accommodate 4 people. The utensils are stainless steel and it has a bamboo cutting board which shows the quality that the backpack has. 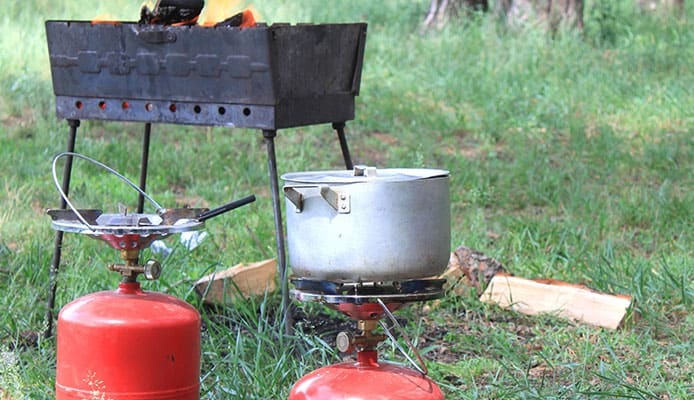 This is a perfect set for your camping trip. Scuddles have produced a great backpack picnic basket for 4 people. In terms of what can replace top rated picnic baskets backpacks like this one do a great job as they have everything you need and to a very high standard. 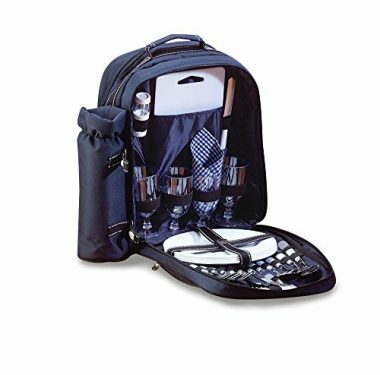 The large compartment, utensils, blanket and additional features are all perfect for your picnic and his bag is very highly rated. This bag has a slightly different design to others and a part of that reason is that it comes with two bottle holders which will appeal to all those who’d think that one wasn’t quite enough. 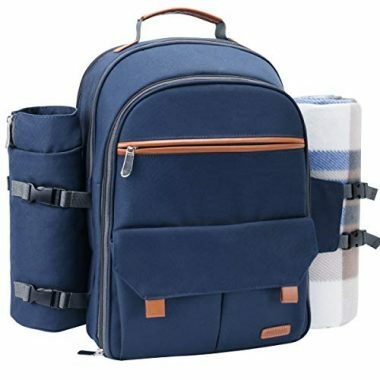 The blanket will instead rest on the bottom of the backpack which is a great solution. It has all of the storage and essentials you need and comes with a phone holder on the front which is highly convenient. This is a stylish backpack for 4 people and comes with the usual bottle holder on one side and fleece on the other. It comes with a large cooler compartment which will be able to store all of your food and the set is made of high-quality so you won’t need to bring anything with you. This is perfect for hiking and will rest easily on your shoulders. This is a simple backpack which is going to be very easy to carry for all of your needs and contains everything that you would want for a great camping trip except for a fleece which would have to be bought separately. It has a very compact design which makes it very easy to carry and to take to wherever you wish to have your picnic. Straps are an important consideration when it comes to picnic backpacks as they are not all built in the same way. You need for the level of padding that you will depend on how far you intend to be carrying your backpack and also the weight of the contents will be important too. 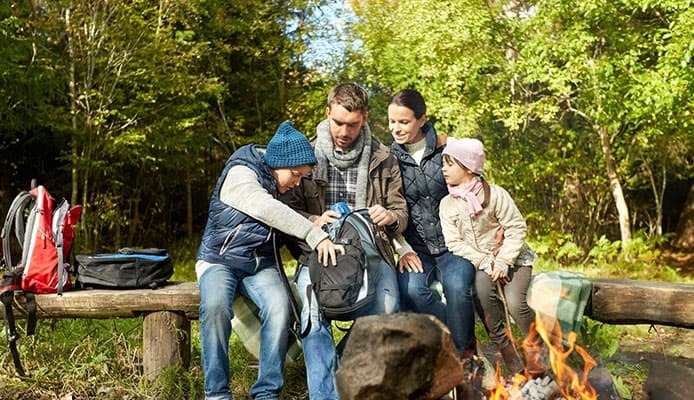 If you are going to be traveling a short distance then this isn’t going to be much of an issue but if you plan on going for a longer hike with your picnic backpack then you want to ensure that the straps are heavily padded in order to cope with the weight. The actual weight of these products is often quite small but the packed weight can be a lot heavier. Not only should they be padded but you also want to ensure that they are adjustable too and able to be held tightly against your body. Other features such as having mesh padding would be useful as this would mean that you would sweat less, especially on the hot days when people would usually have a picnic. The zippers on these products are going to be getting a lot of use and have to be strong enough to be able to cope with the constant back and forth. Strong zippers are an often underrated aspect of any product as when they fail it can cause a huge headache, especially for a product such a backpack. Having two-way zippers is always useful so that you are able to open the zip in whichever way that you like and mostly this will be from the top as you wouldn’t want an open zip near the floor. The reason for this is that insects such as ants will quickly be attracted by any food, which is also why it’s important that the zippers are able to close the bag firmly shut when required. It’s likely that your backpack is going to have a few zippers featured on it, they should be fairly sizeable and easy to pull in order to add to the ease of use of the bag. A faulty zipper could make your backpack unusable and getting a high-quality bag will help to avoid that stress. A lot of these backpacks have a very similar look on the outside but they can often have a different layout in terms of how they set out their compartments. 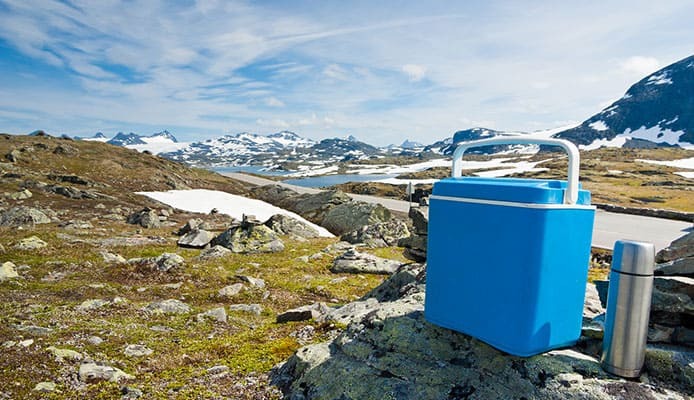 There should be at least one insulated compartment where you would be able to store your food to keep it fresh until your picnic, some come with more than one compartment which is a good way to separate food and drinks. 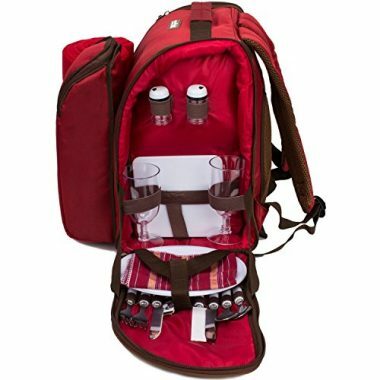 In terms of drink, these backpacks usually have a bottle holder which can often be insulated too. This is perfect for wine or any other beverage that you wish to take to your picnic. Some bags will have two of these which is an added benefit for anyone wishing to take more drinks. Some bags will also have other pockets where valuable items can be kept not relating to your picnic, which is a useful feature. The set-up of the picnic essentials is often the same as this usually comes as a fold-out section which makes it easy to access everything that you need. 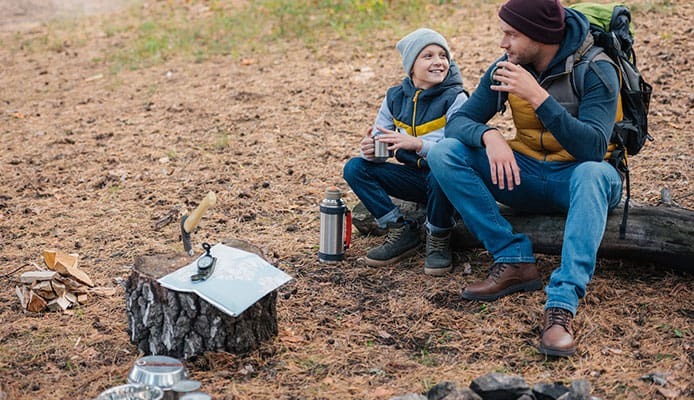 It’s a good idea to plan ahead in your mind to ensure that the backpack has everything you need to make your own picnic essential and make grabbing everything you need as easy as possible. Insulation for these types of bags is difficult to make it perfect and you should expect anywhere near the same level of efficiency as you would do from a cooler box, for example. The reason for that is due to the fact that these backpacks aren’t able to have a vacuum layer around them to prevent the transfer of heat. That being said, some are able to do this a lot better than others and will be able to keep your food and water fresh until you reach your destination. It’s important to have this level of insulation as even though it won’t have the efficiency of cooler boxes, it is still a whole lot better than having a standard backpack in terms of keeping things cold. You want to make sure that you have the features that you are looking for. Some will have one compartment where others have two. Some also have waterproof sections where you would be able to easily keep ice and then quickly clean it once it melts. Unless you have a camping table on which to have a picnic on, it’s often likely that you will end up on the floor. Even if it’s not rained that day the ground can still hold moisture or have dew forming on the grass. This is why having a blanket is important in order to keep you comfortable and dry. One great feature of a picnic blanket is for it to have a waterproof base layer to prevent any of that moisture seeping up into the blanket. Not only can that make it damp but it can also make it cold too which isn’t going to be pleasant. Another important aspect of having a picnic blanket is the barrier that it gives you from any insects below. You want to make sure that it is large enough for everyone in your group to sit on. It could be that you want your own blanket or will have a table to sit on though and there are backpacks available which come without one. Q: What Is The Difference Between A Picnic Basket And A Picnic Backpack? A: Picnic baskets are very much seen as the traditional way to have a picnic where you are able to place everything into a basket and carry it with one hand to wherever you want to go. If you are traveling a long distance though, you can become very tired very quickly. A picnic backpack will allow you to travel for much longer distances without having to worry about the weight as both of your shoulders will be taking it, which is a lot more comfortable. 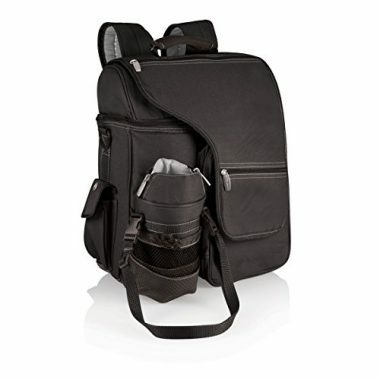 Even over short distances, the ability to just throw a backpack over your shoulder can be highly convenient. Q: How Do I Clean My Picnic Backpack? A: With these sorts of backpacks they are designed with their primary use in mind which means that they anticipate that food and moisture will often be left inside of the bag. Due to this, the surfaces will be very easy to clean so all they would need is a mild soap to bring them up to shape. Hand washing these backpacks will be relatively easy and if they get dirty then it will be a quick process. 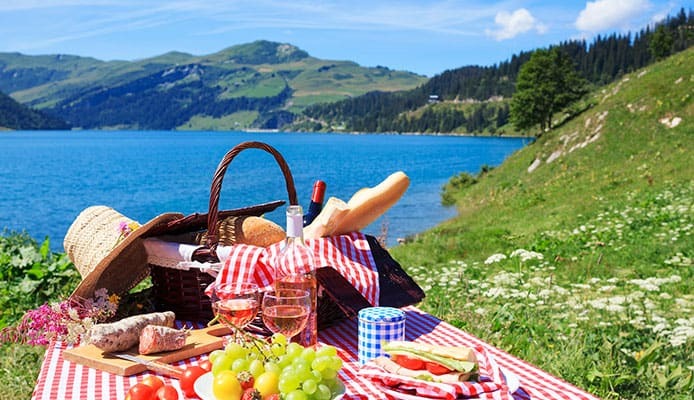 Obviously all of the picnic contents should be washed in the same way that regular dished would and it is a good idea to carry a garbage liner to place all your used plates and cutlery. Q: What Is The Difference Between A Regular And Picnic Backpack? A: You would be able to take a picnic in a regular backpack but then you would have to worry about where you are going to put your drinks and store everything you need for your day out in a safe and hygienic place. This makes it a lot less convenient and also greatly increases your chances of missing something. Also picnic backpack will have insulated sections to keep your food fresh which regular backpacks wouldn’t have. A lot of people stress about not having everything they need when they are going on a picnic. 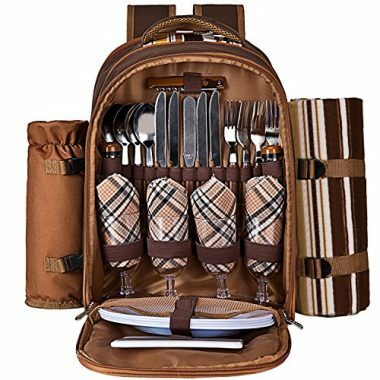 A picnic backpack not only gives you the perfect place to store your food but it also means that you have everything that you will possibly need for a great time. Whether you are hiking or just making a trip from your car, getting one of these backpacks can make your life a lot easier. Choosing the best one for you is important and means making sure that the backpack suits your needs and that it has all the pockets and compartments that you are looking for with any additional features such as a blanket or a bottle holder. Once you have picked the perfect picnic backpack or you then you’ll be able to start your picnic adventure with a bag which will make everything stress-free and easier than ever before. Hopefully this guide has given you all the information you need to pick the right backpack for you and one which will help you have a wonderful time.